Peach Thyme Instant Pot Ribs use sweet peaches & spicy thyme make this grilling sauce AIP friendly an easy way to use up those end-of-season peaches. But don't wait till the end of a peach season like I did get this sauce simmering and grilling as soon as you can! I am scrambling to try to get everything done. You know that frantic panic-inducing mile-long to-do list? That feeling when a simple explanation of your life requires a sentence with three hyphen combinations? Did you notice that? It is where I'm living, this sliver on the edge of meltdown. Just one more hyphen away from combustion. I'm sure many of you understand, those demands of school, work, family and balancing it all. We all need recipes that are easy, nourishing and delicious. Oh, and could they be ready an hour ago? 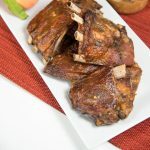 Unfortunately this recipe for Peach Thyme Instant Pot Ribs (haha peach time) don't have time travel properties but are easy, and super delicious. I always get excited this time of year: my day job slows down just a touch and I live in a place that is ripe and abundant with GREAT produce. Peaches, pears, apples, persimmons, grapes, tomatoes, peppers, squash, SO MANY OPTIONS. I will get carried away. I'll end up with piles of amazing organic produce and could spend days standing in my kitchen cooking. Or canning. Trying to preserve the last days of warm nights and long days. I know… what am I talking about? Who doesn't love summer? Me. I don't. It is hectic and I have never really experienced the freedom or leisure I have heard people refer to. But I love the summer fruits! Which means it is early mornings or late nights canning peaches, making jam (this is my favorite, but this one is good too). Trying to capture the magic of summer so that I can enjoy them well into the fall or winter, or as the new buds of spring emerge. This recipe can be made with frozen or canned peaches, making it good anytime. Slightly cooler temperatures draw out the desire to slow cook and simmer. It means how I use my Instant Pot shifts slightly. From using it because the house is hotter than hell to make things like our Moroccan Instant Pot Potatoes because they are quick, to longer cooking kormas, butter chicken, soups, roasts, and ribs! Another great thing about this recipe, you can finish the ribs in the oven, or throw them on the grill if it's still nice enough. Or maybe you are a BBQ in the snow type like Raj. Either way, I'm more of a fair-weather griller myself. What if you don't have an Instant Pot? I get it, maybe you don't think you would use it, or you are afraid of it. Maybe it isn't a financial priority? I use mine every day. Often there are great holiday sales on Amazon! Put it on your wish list or buy one here. You can read our reviews to decide which model might be right for you. But in the meantime, you can bake, steam or boil your ribs however you usually do. There is some great debate, to boil or not to boil. How do you prep your ribs? My Instant Pot has changed my rib game! 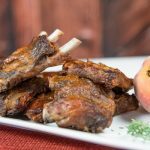 Instant Pot ribs are the best and these peach thyme ribs are a great way to get that sweet and savory sauce without added sugar. Check out some of our other great peach recipes! 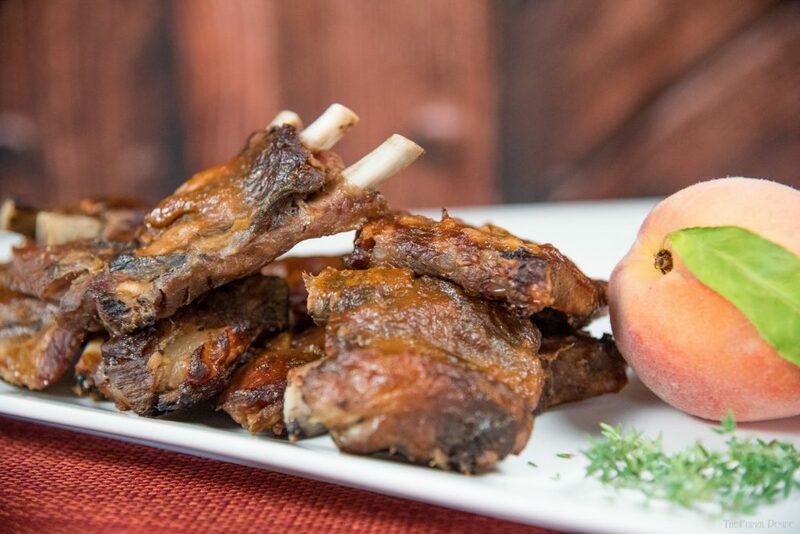 Just in time for the last of the peach season, Peach Thyme Instant Pot Ribs. Sweet peaches and spicy thyme make this grilling sauce AIP friendly an easy way to use up those peaches. cook 30 minutes in an IP, high pressure with a quick pressure release. You can use the meat/stew preset. Blend or mash the peaches into a pure. Add salt, pepper, thyme, and roughly chopped honey garlic to the peaches. Simmer over medium heat approx 25 minutes until it is reduced to a sauce. Brush on pork ribs and bake 45 minutes at 350F until peach sauce is caramelized on the ribs. Alternately you can fire up the grill to caramelize the peach sauce on the ribs. Don't own an Instant Pot? Prep those ribs however you normally do.